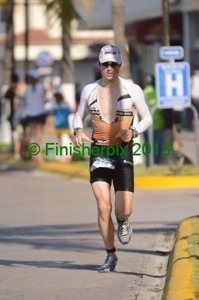 Ironman Cozumel in Mexico. 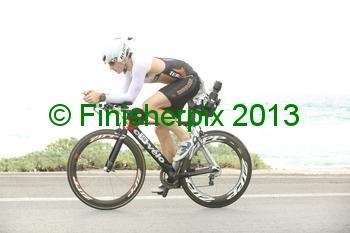 Third ironman in 2013 and definitely a little too late in the season ! 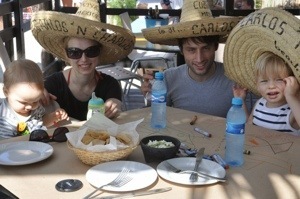 It was indeed quite difficult to train in the cold NYC autumn and as I landed in Cancun, I had a bad cough thatvmyvkids had carried most of November. 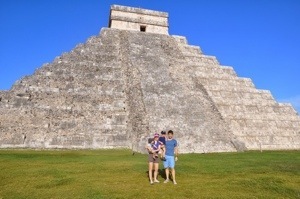 But this race was also about vacation – and we started with the visit of the Mayan site of Chichen Itza. 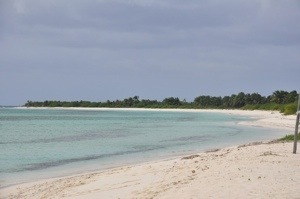 A three-hour drive and 45-minute ferry crossing brought us to Cozunel, where we rented a condo with an infinity pool 50 yards from the finishline (seriously). We spent a few days enjoying the islands, despute terrible winds and waves that were putting into question the swim portion of the race. All pre-race practices were canceled by the organizers. Anyway, between the wild beaches and the lively beach restaurants we were quite busy, and I only biked 45mn and ran 30mn on the island, still a little ill and with a lot of rest I knew I missed. 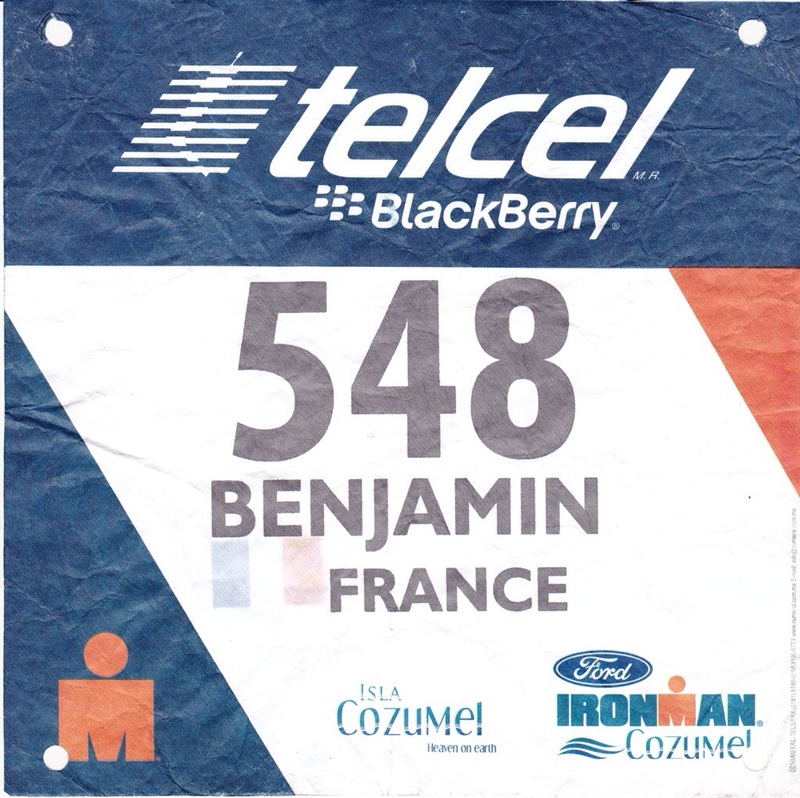 We had to dropped our bikes on Saturday according to a set schedule per bib number. Transition one was 10 miles from town, well set, lots of space, in an aquatic park on the beach. Athletes were stressed since there were rumors of the swim being canceled. As T1 was shaded, I decided to inflated my tires once for all to save time during race morning. Buses brought us back to town to drop our run gear at T2, located downtown. 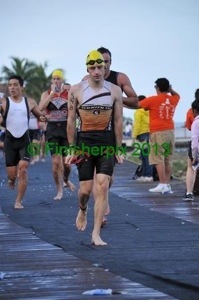 I usually hate races with two transition areas but this one was well-organized. Race day. Waking up at 4.45am, getting on a bus for T1 that broke down, got into a cab to reach my bike at 5.45am. Swim start is moved 2 miles north as current are very strong, it is going to be a short swim ! 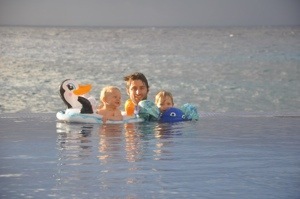 At 6.30am we board buses to go to the improvised swim start in the Intercontinental Hotel. I arrive there 10mn before the start, with a lot of confusion regarding where the water start actually takes place and which side of the buys we have to follow. 7am we start anyway, nice current pushing us, clear water, that’s really beautiful. I recognise the shore and for the first part, we go really fast ! After 25mn, we hit opposite currents, and the real fight starts. I struggle but push hard, seeing the transition tents that seem not to get any closer. Waves are slightly larger now but i rather be done quickly and give more to exit in 42 minutes. I spend some time putting tons of sunscreen after being badly burnt at Ironman Texas, and here we go. The first part is fast, of course. After 20k we hit the south of the island, and start 20k with headwind. 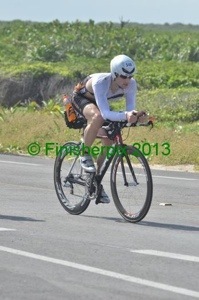 In this section drafting is quite bad, but despite the wind it is the most beautiful section of the island. The last piece is the return toward downtown. 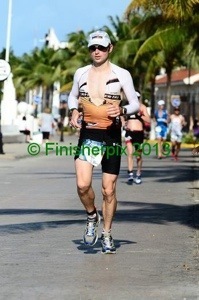 There i am passed by a group of 100 athletes, the worst drafting i have ever seen in my life. Sad. Lap two and three are variations around that theme, with athletes more scattered but still a lot of drafting. 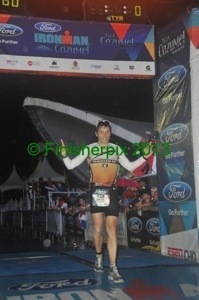 I fade quickly, despite a lot of aid stations it is very hot and sometimes difficult to grab nutrition at some stations. The section across rough pavement really starts to kill my back and morale. But that’s really the toughest part of the ironman, these last 40km where holding aero position is difficult, and you feel that the wind is really strong, you start gettig hungry (it is noon afterall) and youvreally want to dismount. 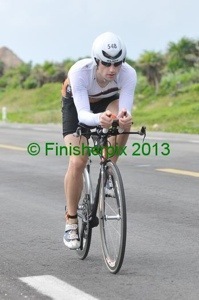 I really struggle to hold 27km/h on the last section with headwind, and then push myself to reach T2 in 5h25mn. 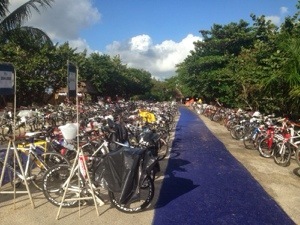 Transition is smooth: bike taken by volunteers, 10 yards to get into the tent, where i put lots of sunscreen (again !) and prepare my feet for the run. 10 yards to exit, and the marathon starts. The rest is classic ironman marathon history. Shooting for 3h45 but soon settling for 4 hours. It is hot out there, and the alternance of coke and water at every aid station gets me moving. Each loop is 14km. As I start lap three, a violent thunderstorm starts, with heavy rains (not good) and a sudden drop of temperature by 5 degrees (good). Some aid stations are deserted by volunteers ! There is pretty much nothing else to do than moving on. I try to skip as many aid stations as I can, even if grabbing something would give me an excuse to walk, and pick up the pace in the last 3km.